I haven't read any YA (Young Adult) fiction for a while, so I was looking forward to reading Libba Bray's A Great and Terrible Beauty; the first in her Gemma Doyle series of historical fiction novels. We first meet Gemma in 1895 India, where she suddenly loses her mother in a traumatic market place death although the family decide to tell people she died from cholera. Gemma is subsequently shipped off to Spence boarding school for girls in England which turns out to be quite a culture shock for her. Watching Gemma trying to fit in and steer clear of the 'mean girls' 1895 style was quite amusing, however the novel's plot soon deepens when Gemma begins to ask one of her teachers questions about the mysterious charm her mother gave her on the day she died, and a group called The Order. 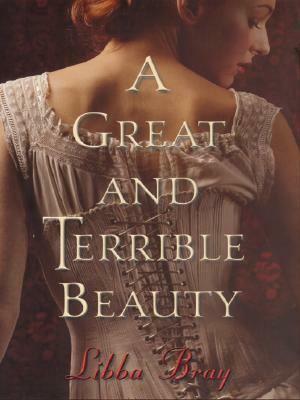 A Great and Terrible Beauty was a truly YA read, and while I was looking for a dark, gothic boarding school read with a mysterious student cult at it's heart, this wasn't it. Instead this was a gentle coming-of-age tale told with well drawn characters and a touch of humour and longing thrown in. Perfect for the intended YA audience. Thanks Tadi, I'm off to check out your blog, great name by the way!